According to a study by SHL of 4 million candidate and employment assessments from 205 countries and territories, only 5.8% of the global population have the ability to truly innovate. This is an interesting finding for me for two reasons; the first is that with a data set of 4 million, this is a significant sample size which means that the results really deserved to be listened to; the second reason is that we face a shortage of innovators in a climate when demand for such qualities is so high, as confirmed by a FutureStep survey, which found that creativity/innovation was currently the most valuable quality in staff. So in this time when there is such a need to find and retain great innovative talent, I thought it would useful to set out several tips to hire true innovators. Before you go out and start recruiting for creativity and innovation, it’s good to find out how much creativity you actually need in your organizations and within your teams. I think that a good template for this might be something like Belbin’s team roles. In this idea, the best teams consist of good balance of these 8 roles: Plant (Creativity/Innovator), Resource Investigator, Co-ordinator, Shaper, Monitor/Evaluator, Team Worker, Implementer, Completer, Finisher and Specialists. If you have too many Plants (Innovators) then your teams may generate too many ideas and not enough results, while to few Plants means your teams may generate good but never great solutions. So, a good starting point might be to do a team inventory to see how well balanced your teams are in terms of creativity/innovation. Also, think about the end products, do your teams generate effective innovative solutions relative to your competition or do they engage in innovative effective working practices relative to your industry counterparts. You may find you have to much innovation, just the right amount or you need more. If you need more innovation, then its time to move to the next step. 2.) Be clear on what kind of innovator that you need. In general, there are two types of creativity, these are ‘Creativity’ and ‘Focused Creativity’. In blue sky thinking and think-tank based environments, there may be more of a need for the former free flowing, big picture creativity. Make sure that you set the right tone with the job description, making sure to incorporate much more flair in your job postings, as this is more likely to attract more inspired candidates than a straight forward notice. You can then use the job advert to help you filter for the appropriate kind of creativity that you are looking for. For example, if you are looking for more focused creativity, then I suggest that you ask candidates to develop a creative solution to a specific job problem that they may face at work. You can either ask the candidate to come up with the original problem, or you can generate the problem yourself. Also, try hiring from non-traditional sources. You can start by asking your more innovative employees for referrals and ask them where you would find them now if you were looking for them again. They may be able to introduce you to communities and networks where more innovate specialists with the right skills convene. There are a range of assessments for creativity in the market-place which you can incorporate into your recruitment process. My preference is to use either a role play scenario or an in-tray exercise where the candidate is faced with a real organizational problem and asked to come up with a practical solution which requires some thought. 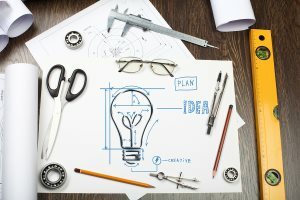 If it were a sales person, they could be presented with a product with a design flaw which was still usable and asked to create an attractive sales proposition or a marketing candidate could be asked to create a marketing campaign for version 2 of a product where version one was known to have been poorly received. And finally, having attracted the creative/innovative talent, it is important to build a culture that is accepting of creative thought and innovative ideas so innovators get to use these qualities that they were hired for — or they may leave. This could include simply creating a culture that is: open to new ideas, accepting of failure, allows people time to focus on creative solutions and rewards people who come up with innovative ideas.